The Tori is a horse of mainly continental Estonia. The Tori comes in black, bay, dark chestnut, chestnut, and palomino. The modern Tori is a harness type horse with a very clean and solid build. Its conformational features include a large or medium-sized head, clean-cut and sometimes with a shortened poll. The neck is medium in length and fleshy; withers are average in height, back long and flat, loin medium and broad, croup broad, long and well muscled. The chest is very broad and deep. The limbs are clean and properly set. The average measurements (in cm) of Tori stallions at the studs in 1982 were: height at withers 162, oblique body length 170, chest girth 200 and cannon bone girth 22.3. The breed's fertility is quite high, reaching 86 foals per 100 mares. 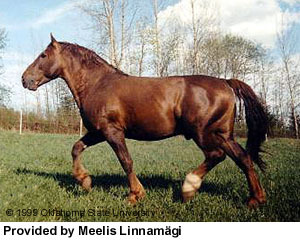 This all-purpose utility breed was developed in Estonia at Tori stud from 1890 to 1950, by crossing native Estonian mares with European halfbred stallions. The breed was founded by the stallion Hetman, the son of Stewart and an unknown hunter mare. Stewart was a crossbred of a Norfolk Trotter and an Anglo-Norman mare. The formation of the Tori breed involved extensive use of Hetman and his sons. As a result, a valuable breeding nucleus was rapidly formed. By the end of the 1930s, however, signs of inbreeding depression were found, which manifested themselves in a deterioration of performance and robustness. Crossing with Breton Post-horse stallions was used to eliminate the inbreeding depression. As a result, the massive type became widespread within the breed and the quality of the gaits began to decline. A need also arose for a combination of utility and sporting qualities in the horses. To meet this need, a limited experimental new introductory crossing between Tori horses and Hanoverian and Trakehner stallions was undertaken. Many horsebreeders started in the last years to breed with studs whose quality was not tested or recommended. The main idea is to get an extremely light sporthorse-type, this selection has resulted in a rapid loss of purebred Tori. In 1999, the number of purebreds is fewer than 100 with only three purebred studs remaining.